In 1922, two sisters from the Jewish town of Baia Maire, Romania, stepped off a ship called "The Reliance" onto Ellis Island in the United States. For Flora and Piroska Gellert, this was the beginning of a long life of travel, performance and fierce commitment to art and personal style. 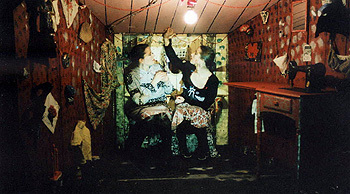 For years, Flora and Piroska performed as "Nita and Zita, International Dancers", traveling throughout this country and beyond. Sewing their own costumes and choreographing their own routines, these two eccentric sisters concocted a life for themselves out of travel, performance and fine fabrics. Towards the end of their careers, the sisters settled into a Creole cottage in New Orleans' Fauberg Marigny neighborhood, performing in the French Quarter and in a nearby bar until their retirement in the early 1950's. The sister's reclusive habits quickly made them neighborhood legends: rumors spread about the "gypsy ladies" who walked to Schwegmann's grocery store wearing formal dresses, and who painted their entire house, inside and out, with wild polka dot patterns. After their death, their costumes, painted furniture, handmade dolls and publicity photos were sold out of their home during a makeshift estate sale. Local and national collectors snapped up the unique clothing and furniture. One of Nita and Zita's showgirl costumes is preserved in the collection of the Louisiana State Museum. 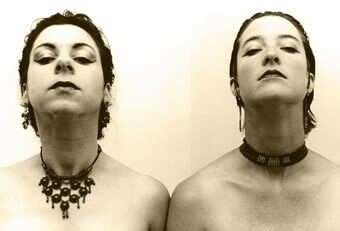 The premiere of ArtSpot Productions' Nita & Zita followed the wildly popular first-draft showing of the piece at Zeitgeist in the Winter of 2000. This full production—performed by New Orleans performer Kathy Randels and New York performer Katie Pearl with a live piano score by Tom McDermott—premiered at The Core, an alternative performance space located on the second floor of the State-Palace Theater in New Orleans. Nita & Zita explores the history, mystery and mystique of these two women through text, movement and music. The performance documents the known facts about Nita and Zita's lives (few), the rumors which have circulated about their adventures (many), and the artists' circuitous search for Nita and Zita (through closets, graveyards, French Quarter alleys, libraries, Jewish archives and more). The performance features Nita and Zita costumes re-imagined by designer Olivia Wildz and sets designed by New Orleans-based visual artist Shawn Hall.